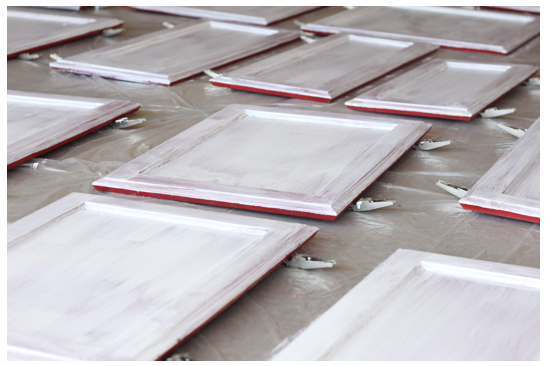 In the house we are living/renting/hoping to buy, the kitchen cabinets were painted a cute farmhouse red. I actually like red, and love painted cabinets, so I was OK with it. The only thing was that I am in love with white kitchens. I have probably pinned about a billion lovely white kitchens on pintrest for inspiration sake. Sorry if you follow me on pintrest and are totally sick of the white kitchen fetish. After all the obsessing, I decided to make a kitchen that I really really liked, into one that I absolutely LOVE. After asking my land lord, I made a drastic change and painted the kitchen white. First off, I must preface this post by saying, this was a HUGE project. I worked on it only during nap time, and when the kids were asleep in their beds at night. We decided to use paint brushes instead of a paint sprayer because we didn't want to dish out $100 a day to rent one or even more than that to buy one. We are on a tight budget nowadays as we are saving saving saving. I know this may have made it more time consuming, but I am glad to have saved the money. It also proves that you can do it with paint brushes. Just be sure to buy good ones. Look, there is my cute husband! He looks oh so good from behind! It took exactly a week of hard hard work. We ate a lot of peanut butter and honey sandwiches, mac and cheese, and taco bell. LAME... but when all is said and done, I LOVE LOVE LOVE how it turned out. My husband jokingly says we are not allowed to do any more big projects like this one for at least a year. He should know me better than that... Like that's going to happen!!!! I had to laugh when he said that. 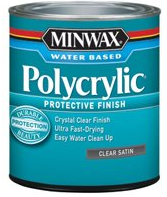 Here is a quick run through of how to paint over red paint. 1. Clean all surfaces with warm water and soap. Dawn soap mixed in a tub of warm water works great. 2. Sand all surfaces. We uses 150 grit sand paper. 220 would probably be fine too. We only sanded lightly, just to rough it up a bit. Don't worry about taking all the paint off. Make sure to sand in the direction that the grain is going. 3. Clean all the surfaces that you sanded again. We vacuumed them, then used this product to clean them down again. 4. Prime your surfaces. 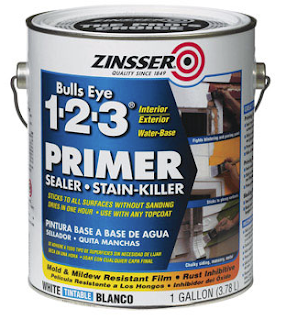 After a lot of research I discovered that Zinsser is the best primer to cover red. We did TWO coats of primer. 5. We then painted. 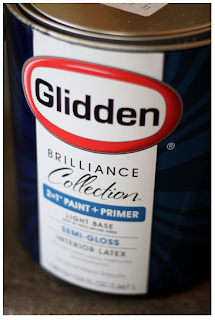 We used Glidden brand paint and primer in one with a semi-gloss finish in Cotton White. We did TWO coats of paint. 6. Finally we sealed it off with a glossy finish of minwax polycrylic. DONE!! If you want to do this big of a project... You can do it! If I can do it, ANYBODY can! It cost us a grand total of about $150 to do this transformation. Not to shabby. looks fabulous! Thanks for sharing. Wow what a huge change with just the cabinet colour! The kitchen looks so much brighter. We painted ours (with brushes, no sprayer) so I know what a huge job it is. You guys are champs to knock it off in a week! 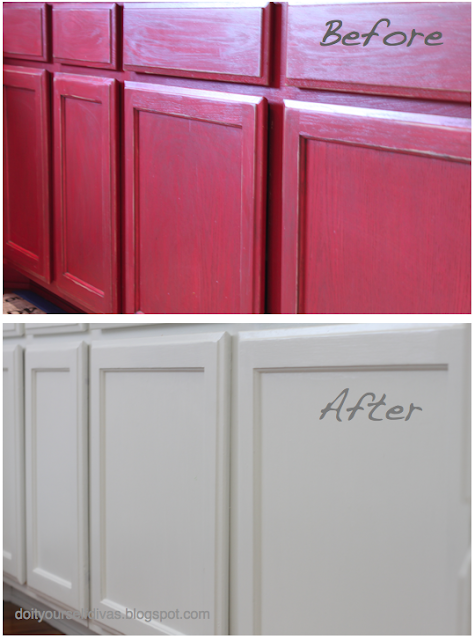 I recognize those red cabinets, but I love the white so much more! It looks fabulous! This helps so so much I am going to need to do this so soon! Excited to follow you on Twitter :). Your blog is fantastic! Happy to know you and follow along with whatever other great things you come up with. Keep up the great work sista! Big difference! It looks absolutely beautiful!